Being creative, is it just being different? Or is it about the volume of ideas, and the quality of the product of those ideas? Lazy Arc (53'18") is the divergent production of Hans-Achim Roedelius and Tim Story. Each man, whose genius may not soon be replicated, comes from a zone of his own - and takes us places we cannot get to with anyone else. Outsiders to this music will have to learn how to listen to it - how to be still, how to hear. In a harmony of opposite tensions Lazy Arc leads us to a world deeper and more ornately textured than we could ever have imagined. Its vast designs realize a few sharp edges but mostly a strong delicate darkness. 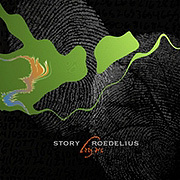 Somehow connected to the two previous Story/Roedelius Ambient-Chamber collaborations Lunz (2002) and Inlandish (2008) Lazy Arc inhabits a realm of heart rending piano motifs, synthesizer thought tones and digital manipulations of sound. In this dream of a work the seven parts lilt, chatter, moan, stumble and rumble their way across one of the oddest and most beautiful soundspaces ever realized. There is this wonderful interplay between the natural soundings of the piano and a subconscious electrical deviousness that engulfs, surrounds, enshrouds, obscures, torments and enhances this most elegant narration. While the mind mess of sound collage may pose hard questions to the listener, please remember that we need this. Too much of today's music is spitefully dissonant, or crude - either that or lacking any mystery whatsoever. Lazy Arc requires more than mechanistic explanation. It is a profound and intimate sonic statement meant to enhance the life of the musicians through creative endeavor. That we outsiders have been allowed access places us among the privileged.